With the use of the video conferencing equipment available at NMBU, Noragric, the Department of Landscape Architecture and Spacial Planning (ILP) and COMSATS Institute of Information Technology (CIIT), Abbottabad, Pakistan are creating global classrooms. 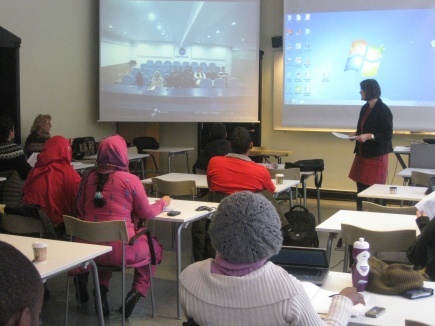 The courses on Gender and Development, Health Environment and Development, and Introduction to Sustainable Water and Sanitation respectively have participants on campus in Norway as well as in Pakistan. Dr. Ingrid Nyborg and Professor Petter D. Jenssen are coordinating the courses from Norway and Dr. Bahadar Nawab from Pakistan. The courses have students not only from Norway and Pakistan, but from several countries in Africa, Asia, Latin America, North America and Europe. The number of students participating is growing; the Gender and Development course held in the January Block had about 20 students in Norway and 10 in Pakistan who participate, discuss and present. The Health, Environment and Development course offered from CIIT from 2013 has more 60 registered students. Lecturing with the use of video conferencing. Gender and Development was opened up to Pakistani students at CIIT on a trial basis this year, and the experiences so far have been good, says Ingrid Nyborg. The video conferencing has made it possible for many others to follow the course without having to incur travel expenses. It also allows students in Norway to directly interact with their peers in Pakistan in both discussions and group presentations. Each year CIIT sends some students to NMBU for academic and cultural exchange. Some NMBU students also visit CIIT for their field and research work which is quite an interesting experience for both institutions. This year CIIT sent three students to attend the Gender and Development course in person, but their visa approval to Norway came too late to be able to join the start of the lectures here on campus. But through video conferencing it was nevertheless possible for them to participate. They were able to follow the first week’s lectures from Abbottabad while waiting for their visa. 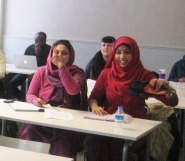 After their arrival in Norway they were able to continue with this course, meeting their fellow students in person. Noragric already has had several years of experience teaching with the use of video conferencing, also with CIIT in Pakistan, where we have developed good routines for joint teaching and curriculum development. This way the lecturers do not need to travel to Norway or Pakistan, which saves money and leaves no footprint on the environment. It also means that they do not need to abandon their regular teaching schedules in Pakistan and Norway and can continue to lecture their own students at the same time – a win-win experience!